We went to the Treehouse Museum as a family on Friday night and I actually remembered the camera this time! It was a fun time, and much easier to chase both boys with two parents. It may become a regular Friday night activity, who knows? Sum tagged me to brag about my spouse. Maybe everyone is tired of hearing about the 1 year old. How long did you date? 6 1/2 mos. Who eats more? Depends on the food. He's more of a snacker, so I have been known to eat more at mealtime. Who said 'I love you' first? Me, and he didn't say it back. Who does the dishes? He does them a lot more on the weekends, but usually me. Before we had a dishwasher, nobody. We were terrible at letting them pile up until we ran out of dishes. Who sleeps on the right side of the bed? Me. We have switched off occasionally to make things more convenient for kids and such. Neither of us really care much. Who mows the lawn? Mostly Gage. I will do it about every 4th time, but it's hard to do with the kids following me. I do a lot of the other yard stuff while he mows. Who cooks dinner? I do about 85% of the time. There are certain things he's better at. He would like to cook more often, but it's just not practical with work. Who sings better? Now, how am I supposed to answer that one? We both really enjoy singing and have talent in that area, so I'll just say I'm a better alto, and he's a better bass. Who is more stubborn? This is a toss up. He'd say me and I'd say him, but that's just because we're being stubborn. I'd say we're pretty evenly matched, and that's saying a lot. It's just a good thing we agree o n the important stuff. Who is smarter? There are many different types of intelligence, but I have to say I married one smart guy! Who kissed who first? Well, we kissed each other, so it's hard to say. It was sort of a mutual thing. Oh, I don't really remember, it was really late. Who asked who out first? I asked him out. He was sort of dating my roomate at the time, and I was playing matchmaker with another couple. I needed someone to go with so they'd have somebody they knew to double with them, and so I asked Gage. I felt comfortable asking him because he was already hanging around our apartment. If it weren't for this, I would have been way too shy to ask out a guy I liked. Who proposed? Gage. I was blowdrying my hair in my room, getting ready to go see Collective Soul that night, and he brought in his guitar and sang a "proposal" song he'd written and gave me a ring. Love, right there next to the anti-frizz gel and unmade bed. Who is more sensitive? I really don't know. It depends on the thing. Probably me, he's the youngest of 6 and I'm the oldest. Who has more friends? Me, for sure. Who wears the pants in the family? Him. We argue until we agree, and whoever has the strongest argument usually convinces the other person. I do let him direct things that he should, though. It will be interesting to see what he says. Now it's your turn to brag....I tag anyone who wants to participate! We just uploaded pictures from this week and I just had to share, E is at such a funny age right now. He has started lining things up, which I guess is a pretty normal thing for kids to do, but M never did that, so it's funny to me. He LOVES to spend a long time (for a toddler) making "snakes" out of playdough, then coming after me with them while screaming "scary!" Waving to me from the back of the train he made (I'm the conductor) He directs me to my spot by pointing and saying "back here" or "up there." When he wants pancakes, he sits takes the mix out and sits in its spot, then screams "make pancakes please!" Wyndham Tax is now officially open for business! Do you need your taxes done? Don't want to buy the software and do it yourself (this is usually NOT cheaper) Call or e-mail my DH and he'll have them prepared and e-filed very quickly. The turnaround time from you getting him the documents to you having the money in your account is around 2 weeks. E-filing is done every Friday afternoon. He is excited to finally have started a legitimate business! He can do personal or business, and knows all about all those pesky inheritance laws and everything. There are a lot of little tricks that you don't get the benefit of from doing taxes with consumer software, but he knows them! As I told some of you, I was taking my kids in for a modeling audition last Friday, but after researching the company, I decided to cancel. If anyone has done this (catalogs, ads and such with kids) please let me know the company you worked with and if they were good, honest, and found work without classes or head shots. This is not something I would normally consider for my children, but have heard from many people that it's a good way to build their college fund with not a lot of work on their part, even DH, who claimed I was "whoring them out" at first, sees some benefit to it now. Why not help them save money for their future by capitalizing on their unabashed good looks? Anyway, let me know if you know. Primary went okay. I think I faked the confidence enough to fool people. There were some things that I didn't think through though, like how sunbeams coming up and holding pictures doesn't quite work for everyone to see them-didn't think of that! I think next week I'll be much less nervous. A funny thing- for the game I told the kids I had forgotten to do my hair that day and had all these little girl bows with songs on the back. They got to pick one and put the bow in my hair, so I looked awesome after 6 of those! Anyway, one of the teachers told me the boy sitting next to her said very seriously that "she doesn't need all those bows, I think it looked better before." I was wondering why nobody was laughing except a few teachers- they took me totally seriously! 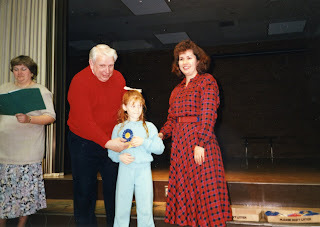 After Jr. Primary (and it went over) I had to run to nursery because they were waiting for me. So I didn't have time to take off all the bows and was running down the hall pulling them out. I felt the need to explain to all the people I passed because I just looked so silly. I did the same game in nursery and I think it was way over their heads. They just wanted to do ring around the rosies. So we did. Today is a very anxious day for me. I have an irrational fear of leading music. (specifically moving my arm and trying to sing at the same time, and fear of falling over while leading (this one is probably not so irrational as some of you may know)) Anyway, I am starting my new calling today, leading the Jr. Primary and the nursery singing. I'm sure after my first time I'll be okay, but right now I'm having a panic attack. I'm not you, you're not me. I'm myself, that's all I can be. 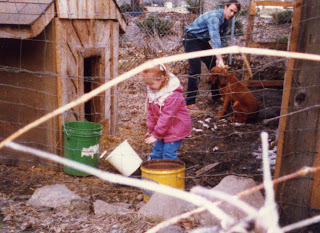 I thought I was SO big when I got my first job, taking care of our landlord's dogs while they were out of town. I think I was about 4. I'm sure, looking back, that my dad did most of the work, but at the time it was all me. 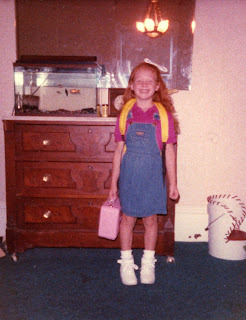 Obviously, this is my first day of 1st grade (see the lunchbox?) Isn't it cool to eat lunch without your mom? I thought it was. 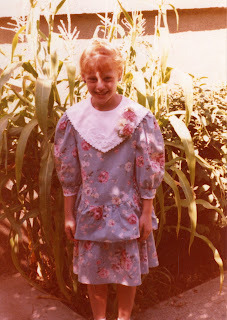 This was the dress I wore on the first day of kindergarten, so thought it was "the first day of school dress," and couldn't be talked into anything else. 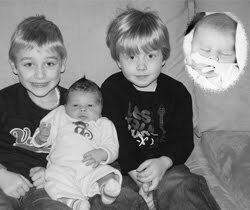 This isn't THE day I got my doll, Elizabeth, but it's the only picture I had of her. 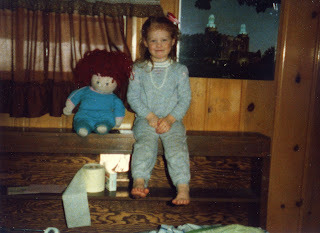 For Christmas when I was 3 or 4, my mom made her herself because I wanted a Cabbage Patch doll, but those were hard to get. This one was even better, because it's clothes were made from the scraps from my clothes, so we matched most the time. (couldn't figure how Santa could do that) Thanks, mom, that was a great Christmas! This is me on August 4, 1989, my baptism day, in front of my faith corn. I asked my dad if I could plant some of the popcorn from our pantry in front of the porch, and he said yes. Of course, he was sure it wouldn't work for seed, or he never would have let me plant in such a place. Never the less, because of my great 8 year old faith, it grew to be tall and very conspicuous. I think I prayed for it a few times to grow, so then thought it was something special and insisted that my baptism picture be taken in front of it. We had a great Christmas. I have tried to blog about it a few times but keep having technical difficulties. Here are some highlights of our Christmas. They are not in order. The boys woke up to quite the Little People "Setup" as M would call it. Apron I made for MIL with some fancy rubber gloves we found her. Thomas wooden trains. He loves them and calls them "chugga chugga"
M giving Oswald his toy hamburger he bought him at the Dollar Store. A few days before Christmas, we did Gingerbread people with the cousins. E is a huge fan of the Brie we had for Christmas Eve appetizers. Grammy read a special story on Christmas Eve to all the kids. You may notice there are no pictures of me. This is the way with mom's on Christmas. I promise I was there and got several nice gifts from the fam. This is what I'm making for dinner tonight, it's a recipe from my friend Mariam and it's really good. I am adding cheese tortellini to it to make it a little more hearty. Saute onions & herbs in 1/2 c. butter & olive oil. Add tomatoes & tomato paste, simmer 10 minutes. In separate cup mix flour w/ some of the broth. Add this and all broth and simmer 30 min. Blend soup. Before serving, add cream, sugar, and 1/2 c. butter, salt & pepper. This makes a good size pot, 6 people I'd guess. It's really good but not so healthy. I'm sure you could make substitutions.